Dexter Robbins had always heard that the biggest plays happen when you least expect them. That was exactly the case as he ran off the edge and blocked Paul Schumacher’s potential game-tying kick to clinch Liberty Football’s (5-3, 3-0) 23-20 win over Gardner-Webb (3-6, 1-2) in overtime. The rest of the team stormed the field as the family weekend crowd of 16,608 rose to its feet and cheered in approval of the Flames performance. It was only right that Robbins, the senior linebacker who is also a team captain, got his hand on the ball for the game winning blocked field goal. 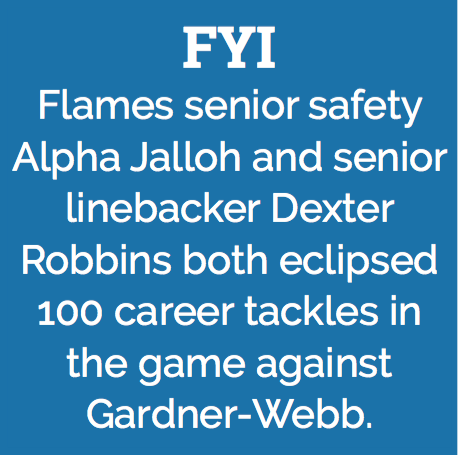 Robbins led the relentless Flames defense with seven tackles on a day when they only allowed 13 points to a high-powered Gardner-Webb offense. The game started off as a defensive stronghold. The Flames won the coin toss and elected to take the ball in the second half and put their defense to the test first. The defense forced a Runnin’ Bulldogs 3-and-out, but the Flames would eventually punt the ball back to Gardner-Webb after only gaining 23 yards on their first drive. The game would remain scoreless until Todd Macon punched in a 3-yard touchdown on the Flames second possession after setting the up the Flames with a 40-yard screen pass up the middle. The Flames defense continued to excel with the help of some dropped passes from Gardner-Webb’s receivers, and the Flames would force another scoreless possession. But the Flames third drive marked the start of some trouble offensively for freshman quarterback Buckshot Calvert. Calvert was unable to find a rhythm as he was sacked five times by the Runnin’ Bulldogs defense. On the day Calvert went 14-23 passing, with two interceptions and threw for 182 yards with a single touchdown. To end the half, the Flames posted two scoreless drives while Gardner-Webb ended its last two possessions with a pair of field goals to enter half with Liberty leading 7-6. The Flames came out in the second half looking to fortify the lead, but Buckshot’s struggle continued as he threw a pick-six to the Big South leaders in defensive scoring to give them a 13-7 lead. At this point the coaches recognized Calvert’s loss of confidence and transitioned to a heavier run game. “We started running the ball more and hitting the simple short routes to get my momentum going,” Calvert said. 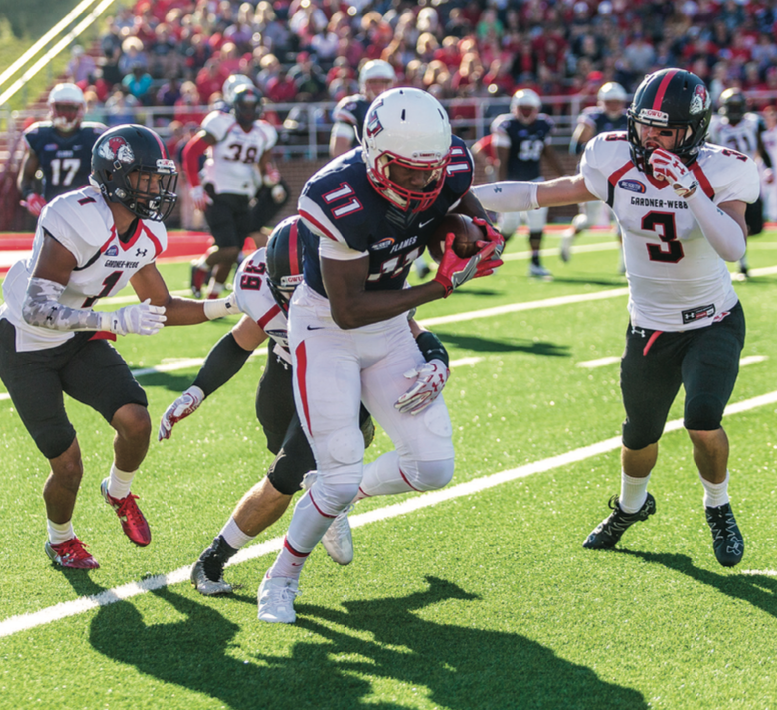 Junior running back Carrington Mosely led the rushing attack for the Flames with 69 yards off 21 carries. The Flames running backs also combined for 72 yards receiving. “We had to be very patient on our reads,” Mosley said. “(We had to) keep pressing the line of scrimmage and be very physical at the point of attack and keep pushing the pile. 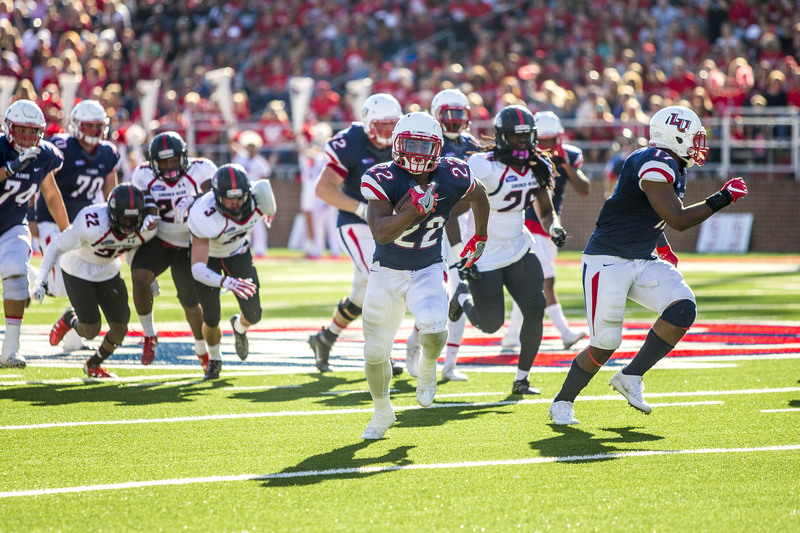 The running attack would gradually break down the Runnin’ Bulldog’s defense as the Flames would produce a field goal on their final drive of the third quarter to shorten the deficit to 13-10. The Flames defense continued to contain the Runnin’ Bulldog’s read option, giving them possession and momentum heading into the fourth quarter. Though Calvert struggled throughout the contest, Gill remained confident in his freshman quarterback and chose to keep him in the game. Early in the fourth quarter the Flames called on Calvert during a gutsy fourth-and-two play, where Calvert faked a handoff and threw a pop pass to tight end Kendall Couamin for 18 yards. The clutch play allowed the Flames to keep their drive alive and eventually kick a field goal to tie the game at 13, with 11 minutes left in the game. The Flames defense again held the Runnin’ Bulldogs and forced a punt that was returned to the Gardner-Webb 41-yard line by sophomore receiver B.J. Farrow. Calvert eventually turned that field position into a 29-yard touchdown pass four plays later. The pass was caught by senior receiver Dante’ Shells, who beat the corner with a double move and wrestled the ball down in the corner of the end zone. “Defensive-wise he was squatting on me a lot, so our coach in the press box called a double move,” Shells said. The reception gave the Flames a 20-13 lead with just under eight minutes left in the game. This time around the Runnin’ Bulldogs rolled over the Flames defense and marched right down the field, led by junior quarterback Tyrell Maxwell. Maxwell capped off the drive with an 8-yard touchdown run up the middle. Liberty would then begin the final drive of regulation from their 25-yard line. At one point Liberty faced a third-and-eight where Calvert had to check the ball off to Mosley, who then broke a tackle and gained the first down off the 27-yard completion. The Flames eventually worked their way to the Gardner-Webb 22- yard line and put the game in freshman kicker Alex Probert’s hands with a 39-yard field goal attempt. The Runnin’ Bulldogs called all three of their time outs consecutively before the final play, in attempt to ice the freshman kicker. Probert’s potential game-winning kick sailed wide left. The Runnin’ Bulldogs won the overtime coin toss, and choose to put their defense on the field first. The Flames went 3-and-out on their first overtime possession after a pair of runs from junior running back Todd Macon and an incompletion thrown to senior receiver Zac Parker. The struggling Flames offense had to rely on their field goal unit once again. Just three plays after missing the potential game-winner, Probert calmly walked onto the field and nailed the 34-yard field goal that would end up being the game winner. The Runnin’ Bulldog’s matched the Flames 3-and-out, thanks to sophomore corner Chris Turner and junior corner Tyrin Holloway’s blanket coverage, and were forced to attempt a field goal. Due to a high snap, Robbins was able to crash in off the right side of the line and block Schumacher’s kick to seal the victory for the Flames. “As a defense we always want to make big plays,” sophomore defensive end Juwan Wells said. The rising defensive star recorded five tackles on the day, along with two hits on the quarterback and a 10-yard sack. The Flames defense did not force any turnovers, but made big plays when the game was on the line. The stingy defense only allowed the Runnin’ Bulldogs to convert 5-17 third down attempts. The Flames only allowed a single touchdown and two field goals on a day where special teams proved to be the deciding factor. On the Flames side, Probert cushioned the sluggish Flames offense, converting 3-4 field goals on the day as the Flames struggled to find the end zone. The Flames only posted 291 total yards, after putting up 681 total yards against Monmouth on Liberty’s homecoming weekend. Both teams’ efforts in the film room paid off defensively as the two powerhouses, who combined for 1,162 total offensive yards in their previous games, only combined for 556 total offensive yards on the day. But in the end, Liberty’s defense would get the edge as it held the Runnin’ Bulldogs to a three-and-out on their first overtime possession that led to the blocked kick. The victory gives The Flames their fourth consecutive win and keeps the Flames undefeated in conference play. The Flames play Charleston Southern (5-2, 2-0) Nov. 12. at 3:30. Davis is the asst. sports editor.